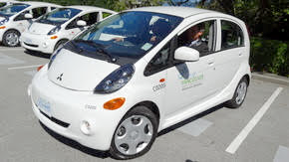 In 2009, the City of Vancouver was one of the first to pilot the Mitsubishi i-MiEV as part of their fleet. By 2012, the number of EVs in the city’s fleet grew from 1 to 17, not including the electric bikes and scooters used by staff to get to and from meetings. The city currently has 31 EVs in the fleet with plans to have at least 115 by 2020. These EV’s are utilized by a variety of departments including Police and Fire departments. The city has partnered with Modo, a car-share co-op, to further utilize EVs and also to manage booking of fleet vehicles. Modo purchased the first EV for their fleet in November 2011, and it was subsequently available to city staff for use. Since 2009, the city has been in a novel partnership with Modo to access their fleet instead of relying on vehicles restricted to city staff. With access to Modo’s 400 cars the city has been able to reduce the number of fleet vehicles they have while saving money. As part of this partnership, the city allows Modo and car-share services to access city-operated charging stations. The success of the EVs in the city’s fleet has helped to reduce fleet GHG emissions by 11% from 2007 levels. The partnership between the city and Modo has resulted in a synergistic relationship, helping the city reduce the size of the fleet while managing the booking system for 16 city-vehicles including 4 EVs. The additional benefit of charging stations available to the public makes this a win for everyone.